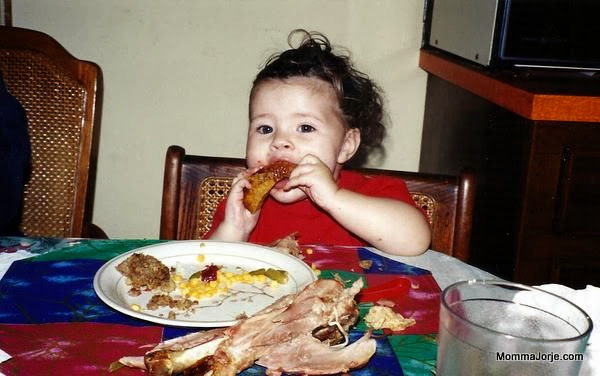 Momma Jorje: Thanksgiving Meal, Thankful? My family of origin has always done the big turkey dinner, and dad is our chef. I have tried to do it all myself and *hate* it, but I'm more than happy to bring sides :) I keep intending to help dad, so I can get all of his tips (as it is, whenever I have to make turkey, I'm calling him 30 times), but when he takes over it's just so easy to let him do it all! We've been doing Thanksgiving at my parents' house since my grandmother passed away a few years ago. It's just my mom's side of the family. I'm not sure what we're doing this year, though - I totally ruined Thanksgiving last year and some tensions are still high in the family. Either way, we have a trip scheduled, leaving at 2:30 am Friday, so we'll be low-key and resting either way. Mmm…deviled eggs! I agree that bringing dishes makes you feel like it's more your celebration. I am so grateful that my husband loves to cook and that he is a wonderful cook, so he is usually right in the thick of things in my mother's kitchen. I usually make cranberry sauce from fresh cranberries since this is more akin to baking which I feel far more comfortable with when cooking for a large crowd. I'd be more inclined to bring the dessert. I sometimes worry how I will handle it when the day comes that it is our turn to host Thanksgiving dinner. I guess I'll just be grateful to have family to cook for who (hopefully) actually want to spend the day with their parents! Happy Thanksgiving! Usually we got to my in-laws, amd I bring pumpkin pie amd a sure dish. I definitely think I get more into it when I feel like I brought an essential part of the meal!